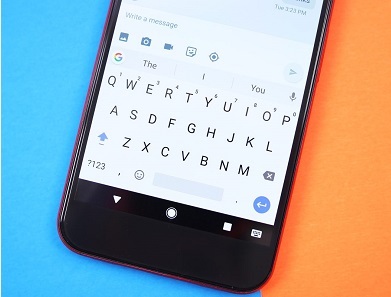 Gboard which is Google's own keyboard app is arguably one of the best keyboard for both android and iOS users. Even with its simplicity, the app comes with lots of amazing features that many users might not even know about. Even if you have been using Gboard for a long time, there is a great chance you are not even aware of most of the amazing features that comes with this app. In this post, I will just highlight a few of them. You might find large screens really cool when watching movies or playing games but it's really frustrating when you are trying to type on it with just one hand. Gboard has one cool feature known as one handed mode which lets you move the keys to either the left or right hand side for easy access. To use this, Press and hold the Enter key and slide to the icon of a hand holding a device. The keyboard will zoom to the right side of the device, to zoom to the left, just tap on the Arrow icon on the left side of the keyboard. To return to the normal mode, just tap on the Full Screen icon. Gboard and a few other keyboard apps have the ability to learn your most used words and with that, gets better at predicting what you want to type even before you do so. But the learning process starts from scratch when you get a new phone. Gboard can actually sync your learned words across devices so you don't have to start over again. To enable it, Tap on the Google icon > Settings > Dictionary, then slide on the Sync learned words option, then tap OK. Then you choose the Google account you want to sync your devices. Am sure most of us have been in a situation where we are not so sure of the spelling or meaning of a particular word and we have to minimise what we are doing to look it up on Google or an offline dictionary. Now, Google recently added a built in Google search to it's keyboard app. To use it, all you need to do is to click on the Google logo at the top left corner of the keyboard and type what you want to search for. After that, just click on the search icon on your keyboard. With this, there is actually no need switching between the alphabet and numeral keyboards or holding down a letter to input a number. You can just easily add the number row permanently to the top of the alphabets on the keyboard. Just open your Gboard settings >> preferences then enable the "number Row" option. With the Gboard Translate, the keyboard can translate any word or sentence you type in and even read it out in real time. Using this is pretty easy, just click on the Google logo, tap on the first icon with the letter G written on it, paste the words you want to translate into the box and select your language from the drop down menu. All apps have different ways of accessing the Emojis but with Gboard, you can easily access the Emojis irrespective of the app you are on by just holding down the enter key or comma (,) and sliding to the similey icon. This is similar to the permanent number row only that it's only shows in emoji keyboard mode. Once you turn it on, your list of recently used Emoji will always appear at the top once you switch to the emoji keyboard. To enable it, click on the Google icon > Settings > Preferences and enable the Show Emojis in Symbols Keyboard option. You can quickly search for emojis even while you are in the normal keyboard mode. Just hold down the enter key and type the first letter of the emoji you are looking for. Gboard with immediately switch to similey with related search results. Gboard now also comes with inbuilt Gif search but this will only work on apps that actually supports Gifs like WhatsApp, Telegram, Gmail etc. To use, just hold down the enter key or comma (,), then slide to similey. At the bottom of the screen, just click on Gif. With that you can easily search and share GIFs. So guys, here are just few of the things you can do with your Gboard. If you think there is anyone I miss out then let me know by dropping it in the comment section below.